The Civil Process and Court Services Unit is comprised of two certified law enforcement officers. These Deputies provide Court Security and Services for all Criminal and Civil Hearings. They are also responsible for serving all civil papers, summons, subpoenas non-enforceable, enforceable writs and injunctions. These Deputies serve approximately 9800 court related papers on an annual basis and provide Court Security for hearings on a daily basis. Non Enforceable Writs: Witness Subpoena, Summons, Garnishment, Notice to Appear and Order to Show Cause. The fee is $40.00 each. Send the original or certified copy of summons along with one copy of summons and a copy of the complaint. Please allow two weeks for return of service. Levy: fee is $50.00 for each. Enforceable Writs: Writ of Attachment, Possession or Replevin, Order Contempt and Commitment and Bodily Attachment. The fee is $90.00 each. Send original or certified copy of writ along with one copy of writ and a copy of the final judgment. Executions: The following are cost associated with executions of the civil process. 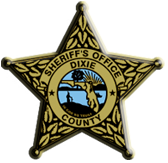 The Dixie County Sheriff’s Office serves only Enforceable Writs for Out of State Service. The Sheriff’s Office does not serve Non-Enforceable “Out of State” Writs.